C Herb has been used by herbalists, shaman, chiropractors, naturopaths, massage therapists, dermatologists, nurses, MDs and others for removing skin "major issues" as well as warts, moles, cysts, and other foreign pathogens. Prior to using C-Herb External or Internal read the instruction carefully! Treatment of some known conditions (major health issues) should follow the standard oral treatment. (When using the C-Herb internally, it is important that there has been no chemotherapy treatment within the last 90 days in order to avoid overwhelming the immune system). A normal human body develops immune cells, including NK (Natural Killer) cells, antibodies, B-cells, lymphocytes, T-cells and white blood cells. These immune cells act as a line of defense against invading pathogens and foreign objects to prevent disease and illness. The NK cell is uniquely different from all other immune cells in that it does not take 2 weeks to develop the ability to kill pathogens. NK cells, when stimulated, have the ability to identify and cause the destruction of "damaged" cells, viruses, and many other invading pathogens upon first time contact by either directly destroying the pathogen or marking it for destruction by another immune system element. Two key immune system terms are mobilization and stimulation. Mobilization is the release of the immune cells, including NK cells, into the bloodstream. The blood then provides a mechanism of transportation and communication for the cells. NK cells are like firemen, housed in a fire station (organs of the body) just waiting to be called out to a fire. Just as a fire alarm sends the firemen to the site of the fire, foreign cells, infections, trauma, stress, disease and exercise send large numbers of NK cells into the blood where they seek out and identify the site of the problem or emergency. Stimulation: An NK cell is stimulated when it is armed, meaning that it has the ability to kill, destroy, or mark foreign cells for destruction. Just as an atomic bomb must be armed before it can be exploded so must these NK cells be armed (stimulated) before they can destroy foreign cells. Once armed, these NK cells are ready to be mobilized and identify foreign or non-self cells from normal or self-cells. After these non-self cells are identified as foreign, the NK cells will directly kill the offending cell or mark it as a foreigner where it will be destroyed by other components of the immune system. A stimulated NK cell needs only to come in contact with a "damaged" or virus cell to cause its destruction. In a major breakthrough of current NK cell research it has been demonstrated that certain herbs, circulating in the bloodstream, will combine with the effects of specific types of exercise (such as walking or low impact aerobics), causing the body to naturally mobilize and stimulate NK cells. These stimulated NK cells have demonstrated an increased ability to kill "infected" cells vitro and in vitro. Just as NK cells are stimulated internally by herbs and exercise (and C-Herb), it appears that they are also mobilized and stimulated by topical (surface) application of C-Herb to the skin. The response to the signal provided by C-herb is very predictable and repeatable. It is reported that an individual can feel the exact moment when C-herb begins to stimulate the natural immune functions. The sensation has been described by some individuals to be like a slight sting, pinch or itch. The stinging has been reported to last up to 4 hours after application. When one feels this sensation one can be assured that the offending tissue is being successfully attacked by the immune system. This natural process eliminates the non-self cells including the total root system, leaving a vacated cavity. Since the normal body cells have not been removed or destroyed, the body remembers its original genetic makeup (DNA) and the healing process will return the tissue to its original genetic blueprint. C-Herb theory suggests that oral ingestion should cause systemic effects similar to topical application. There have been thousands of people who have taken C-herb orally with much success, especially when combined with immune-enhancing supplementation (see Big-C Combination for a major health issue). C-herb may significantly inhibits Herpes virus growth. (See Herpes Combination). C-Herb has been used successfully to remove warts from the teats and udders of cows (the warts can interfere with the milking process and cause discomfort). The application and process of removal has been essentially the same as that reported for humans. No adverse affects have been identified on cows. C-Herb has been used to successfully remove abnormal tissue from the ears of horses, dogs and goats! A significant number of individuals have topically removed "major skin issues" as well as warts, moles and other foreign cells from various areas of the body. The removal success rate approaches 100% and few side effects have been reported (In some cases people have used C-herb internally as well as externally). It is important to note that excessive application of C-Herb will cause a dry-white rash in many cases and make the area much more swollen, tender and irritated than is necessary. Water, fiber, black walnut, burdock, white oak bark, mineral salts and proprietary herbs. The larger the area treated and the deeper the tissue is affected the longer it takes for the herb to work. It is quite normal for a small mole or wart to be removed within 6 to 10 days after treatment is begun. It appears that topical application of C-herb to offending tissue mobilizes a local immune response that destroys "major" skin issues, viruses and other pathogens with the activated Natural Killer cells, macrophages and Tumor Necrosis Factor cells. We know that C-herb effects the ability of these pathogens to hide or camouflage within the large protein molecules they often use for this purpose. After C-Herb is applied to the offending tissue it works in a very predictable manner. 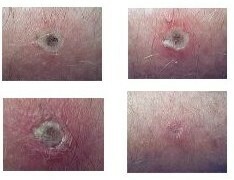 24 hours after the application one can expect a red ring to surround the offending tissue site and some itching may occur. This indicates the immune system has been activated and the removal process has begun. After 48 hours the red ring will have a degree of white adjoining it, suggesting a concentration of white blood cells now surround the foreign tissue. On days 3 to 5 it appears that the immune system identifies and destroys the abnormal or foreign tissue and separates it from normal tissue. 5 to 7 days after the first application one can expect the offending tissue to turn dark and slough off. 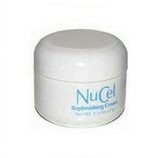 The vacated root system leaves a cavity, now is the time to apply the NuCel Replenishing Cream which fills in within 10 to 14 days, usually with only a slight pigment change or discoloration. A collagen deficiency may cause some people to scar from this process, but that is not a normal experience. When removing warts or moles it is recommended to first apply the Replenishing Cream to the area. Do this several times a day for a couple of days prior to using the C-Herb. This helps the area to become moisturized and softened. Once you have used the C-Herb (do not use C-Herb more than once a day for 3 days) and the wart or mole has been removed and the healing process has begun, apply the Replenishing Cream once again. The Replenishing Cream assists in the healing process and reduces scarring. Please remember that the Replenishing Cream is not an antiseptic or antibacterial cream. Start by using C4 Cream alone if for the lips, eyelids, nose, ears etc. It might take a bit longer as C4 is much milder than c-herb. C4 is a combination of C-herb external and the replenishing cream. You can apply C4 morning and night or several times a day. If nothing happens, after a few days, you might have to mix a tiny bit of C-Herb with your c4 cream.